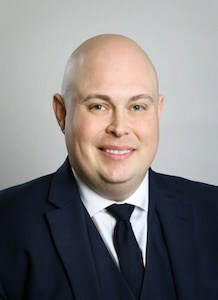 Andrew Spoon graduated from Arizona State University with a Bachelor of Science in Political Science focused on public policy development, then graduated from the top-ranked trial advocacy program at Baylor Law School with a concentration in criminal law and practice and trial advocacy. During his time with Baylor, he head-started a program to raise awareness for mental health advocacy among graduate students, eventually working with the student affairs department to introduce new policy giving all law students access to counseling and health programs they had not previously had. He also accrued hundreds of hours of volunteer time with local ministries as a musician, and as an aide with the Central Texas Humane Society. Mr. Spoon spends his free time studying the history of Ancient Egypt and restoring vintage memorabilia.